Ras Marakz project will dress the Sultanate of Oman to become an international center for the storage of Crude Oil and its Derivatives. Establishment of tanks for the storage of Crude Oil and its Derivatives and Floating Platforms for oil import and export. Execution of Marine Facilities to import and export oil with a handling capacity amounting to 100,000 Barrels per hour (B/H) during Phase I of this project. 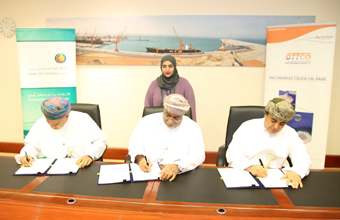 The Special Economic Zone Authority at Duqm "SEZAD" has granted Oman Tank Terminal Company LLC "OTTCO" a Usufruct Right to construct Ras Markaz Crude Oil Storage Terminal. Oman Tank Terminal Company LLC "OTTCO" is one of Oman Oil Company’s subsidiaries, the Investment Arm for the Sultanate of Oman in the field of Oil and Gas Industry. The establishment of Ras Markaz Crude Oil Storage Terminal falls under the Sultanate's Promising Plan for Economic Diversification and Maintaining a Crude Oil Storage Terminal for Oman and as an endeavor to dress the Sultanate of Oman to become an international center for the storage of Crude Oil and its Derivatives Leveraging in this regard upon its particular geographic location alongside the Indian Ocean. Moreover, the newly established terminal will help the Sultanate of Oman find an additional port for the export of crude oil. Ras Markaz is located 70 KM south of Al Duqm Centre and it was added to SEZAD by virtue of Royal Decree No. (RD 5/2016) issued on 28 January 2016 AD. The total area allocated for Ras Markaz Crude Oil Storage Terminal is 1253 Hectares which is deemed convenient for high storage capacities. The agreement grants Oman Tank Terminal Company LLC "OTTCO" exclusive rights for the storage of crude oil and its derivatives in Ras Markaz Area for a period of twenty (20) Years and for Five (5) Years in The Special Economic Zone Authority at Duqm "SEZAD" as a whole provided that no other company will be permitted to establish or carry on any similar activity i.e. the storage of crude oil and its derivatives during these periods and locations. The agreement which will last for 40 years stipulates upon the development of Ras Markaz Area under a Five Year Plan which will cover the establishment and construction of Tanks for the storage of crude oil and its derivatives, establishment of floating platforms and piers for the import and export of crude oil and its derivatives, pier for the tug boats under water pipelines to receive and export oil with lengths ranging from 5 Km to 7 KM. The plan will cover also the establishment of a plant for pumping oil to the tanks. The Project will include laboratories, control rooms, administrative offices for the company in addition to the other safety and securities facilities. The new terminal will be designed in a manner to allow for blending , loading and unloading the ships at reasonable times the matter that help the clients save the logistic costs deeming it as a competitive privilege. Moreover, the geographic advantages for Ras Markaz location will provide and maintain a free access to the newly established terminal with an operational capacity around 99%. According to the agreement, the storage capacity for the newly established terminal during Phase I will amount to 26 Million Barrels and it will be executed along a period of ten (10) years commencing as of the date of contract signature, and the company will gradually increase its capacity as per the growth of the demand. According to the agreement, Oman Tank Terminal Company LLC "OTTCO" will be committed to develop all five phases either personally or via investment consortium or by means of soliciting and utilization of third parties' investments. Total investment during phase I is expected to reach 1 billion and 756 million US Dollars inclusive of 815 million US Dollars invested to cover the costs for the Crude Oil Tanks and 941 million US Dollars covering the costs for the construction of the marine and other infrastructure facilities. Phase I will cover the construction of Crude Oil Storage Tanks with capacity of 26 million barrels. Moreover, during phase I, Oman Tank Terminal Company LLC "OTTCO" will execute marine facilities for importing and exporting Crude oil with a handling capacity of 100 barrel per hour during this phase of the project apart from the onshore Pumping Plant and the basic internal infrastructure within the boundaries of the area. Volume of investments for Phase II tanks is expected to be around 700 million US Dollars, 225 million US Dollars for the basic infrastructure facilities, Oman Tank Terminal Company LLC "OTTCO" has estimated the investments required for the remaining three phases in an amount of 700 million US Dollars for each phase for the construction of the crude oil storage tanks and approx. 381 million US Dollars for each phase required for the establishment of the basic infrastructure facilities.